« WND – The Curse of the Devilled Eggs is Lifted! WND – You want me to do what? Some of my best friends make recipes out of Martha Stewart Living. This is actually true and not just a facetious statement, and since occasionally they bring us the fruits of their labors and thus far haven’t shown any signs of alien possession we call this quirky and endearing rather than insane. Admittedly I occasionally read Martha Stewart Living – usually when I’m over for dinner at afore mentioned friends’ house – but I’ve never seen a recipe of hers and thought, “now that’s something I’m going to make”. It isn’t that her recipes are unappetizing, it’s just that they’re unrealistic. They’re for desserts that call for 30 eggs and involve three cakes stacked together to make a single centerpiece. They’re for stews that have 18 steps and take five hours to make. I lack that kind of patience. There was an article in the New York Times a few weeks ago about recipe deal breakers. At what point do you throw up your hands in exasperation and turn the page? Is it when the recipe calls for a helper? Or when it requires that you kill your own pig? Or make your own stencils? Or find 24 freshly pickled grape leaves? Personally, I don’t deep fry. I flip the page when I get to the words candy thermometer. I skip anything that has a recipe that runs for more than a page – this alone omits most Martha Stewart recipes. I object to any recipe that says it’s for a week night dinner but calls for 30-45 minutes of marinating time before you can start cooking – I get home at 7pm and I’d like to eat dinner before 9pm. I object on principal to recipes that require me to get every pan in my kitchen dirty to make one dish. Everyone has a different threshold for pain, a different point at which they say I’d rather let someone else deal with the effort and the dirty kitchen. This is what restaurants are for. Some people will cheerfully brine chickens and slather butter under their skins. Some of us think that’s far more effort than they want to go to for some roasted chicken. Some people will (apparently) peel mushrooms, and some people are too lazy to even peel the potatoes for their potato salad (see below). My pain threshold was particularly low this week. I was contemplating a recipe that called for slow cooking something over a five hour period and I realized that I just didn’t have the energy this week. This dinner, on the other hand, was so spectacularly easy that by 7pm on Wednesday the table was set, the chicken was in the oven, the melon was sliced, the salad was ready and I was sitting in the living room flipping through a cooking magazine*. * Full disclosure: I made the potato salad the night before so it would have time to chill, and I crushed the corn flakes and mixed the egg wash while I was waiting for the potatoes to cook. Even that, all told, took less than an hour and most of that was waiting for water to boil and potatoes to cook. Crush your cornflakes and place in a shallow dish, and mix with paprika, salt and pepper. The easiest way to crush cornflakes is in a zip lock bag with a rolling pin. 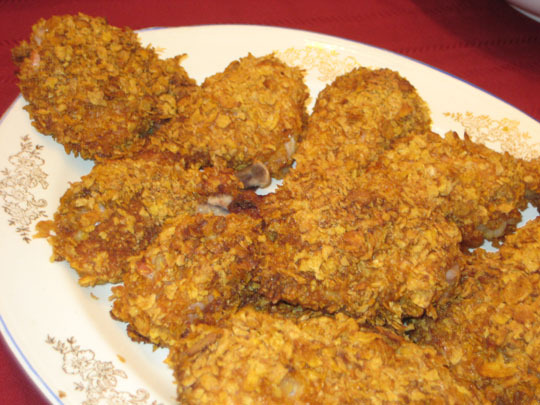 Coat the chicken in the egg wash and then dredge in the cornflakes. Place on a lightly greased cooking sheet and bake at 350 until done and crispy. Given that I don’t actually like potato salad all that much the fact that I’ve been craving it for the past two weeks is a little unusual. Potato salad is one of those summer staples that I usually try and avoid. It’s heavy. It’s often fairly flavorless. It’s frequently greasy and tastes overwhelmingly of mayonnaise and not much else. On the hand very occasionally you get some potato salad that’s truly spectacular. Given that I don’t like potato salad I didn’t have a go-to recipe to use when I finally gave into my craving, so I had to go searching on the internet and hope that I’d found a good one. Turns out, this is one of the best potato salads I’ve ever had. Cook the unpeeled potatoes until fork tender. 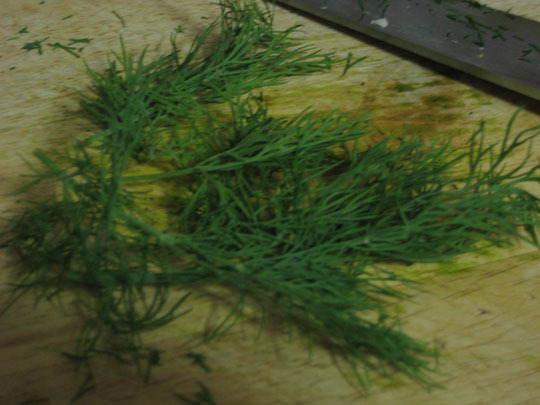 Meanwhile grate the onion into a large bowl and chop up your herbs. Drain the potatoes and when they are cool enough to handle, but still hot, cut into bite size chunks (you can rub them with a towel to peel them if you want to, but I like the skin on potatoes). Mix with grated onion and sprinkle with vinegar and some salt & pepper. 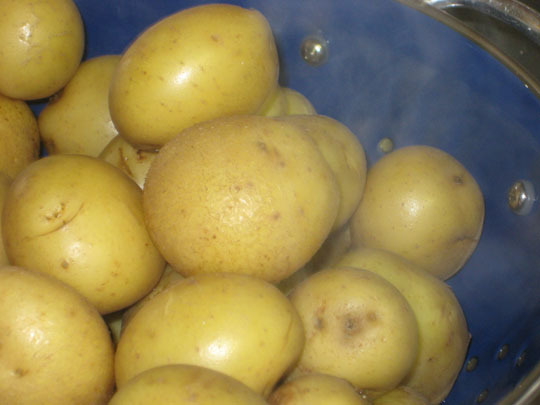 You want the potatoes to be well coated, but you don’t want a large pool of vinegar at the bottom of the bowl. It’s important that the potatoes are still hot when you do this. While the potatoes are cooling to room temperature, mix together the mayonnaise, mustard, and garlic. 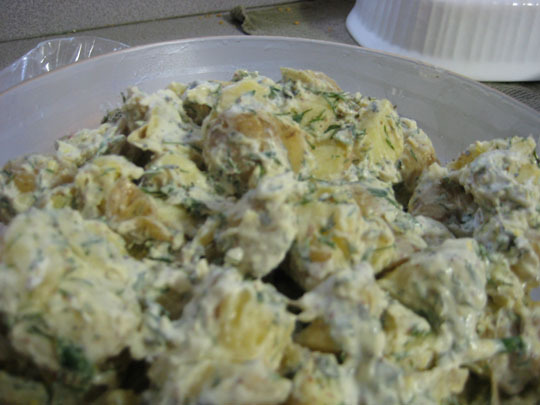 Toss the potatoes with the herbs and dressing, adding more mayonnaise as needed. The corn pudding was fantastic, even if I did find myself calling it corn pone. What is corn pone, anyway? Glad to hear you weren’t starving my roommate – that’s my job. Corn pone is a kind of eggless corn bread that’s usually fried.